As told by Eric Johnson, Wesley Chapel Rotary Club. Traveling to another country is always an adventure! Whenever you experience another culture, you often see, taste, touch and smell things for the first time. It changes you. You grow as a person.Your faith in yourself grows. After every trip to Honduras, with Pure Water for the World, I return a different person. 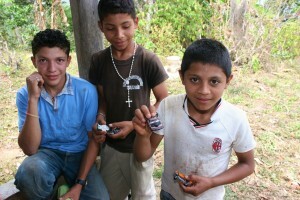 One story I love to tell is about a group of boys I handed some matchbox cars to. These cars were special to me because they were donated from my boys….old cars they didn’t play with anymore. They were excited to know that the little boys in Honduras would be playing with the cars that they had played with for years. So I noticed a few boys running around in one of the first communities we arrived to work in. I reached into my bag and pulled out a few of the matchbox cars to give them. When I called the boys over, I handed them each a car. They all smiled but just kind of looked at them, rolling the wheels with their fingers. I quickly realized that they had never seen or played with a matchbox car!!! Kind of astonished, I motioned to one of the boys to let me see his car, took it, knelt down to the ground and started playing with it on the ground. Of course they quickly took their cars and began playing with them in the dirt, too! Being typical boys, I even saw them finding some boards and tires to roll the cars on. I remember standing there, watching them run around with such excitement for their new toys, and I thought how crazy it was that these 6, 8, even 10 year old boys had NEVER seen a simple matchbox car…a toy the most boys in America have had at least 50 of by the time they are 6! What we take for granted is always what affects me the most when I travel overseas. 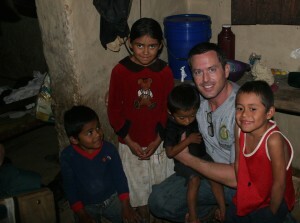 This April I’ll be returning to Trojes, Honduras for my fourth time. For sure I’ll bring little gifts for the kids because it puts beautiful smiles on their faces. But I love this quote from Khalil Gibran, “You give but little when you give of your possessions. It is when you give of yourself that you truly give.” How can you give of yourself today? Join Eric and Pure Water for the World on #GivingTuesday! PWW Travelers Honduras, PWW Travelers, PWW Trips, PWW Volunteers, Travel for Good, volunteer for good, WASH. permalink.